Dr. Isaac J. Crumbly, associate vice president for Careers and Collaborative Programs, is the founder and director of the Fort Valley State University’s Cooperative Developmental Energy Program. 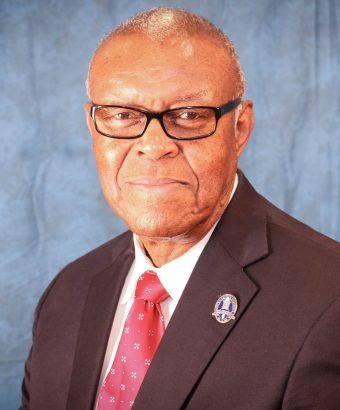 He has served Fort Valley State University as a faculty, director, dean of Arts and Sciences, and associate vice president and vice president for Careers and Collaborative Programs. Dr. Crumbly has achieved success as a developer of innovative programs, a researcher, teacher, and mentor. He is a skilled grants person and has provided over a $30 million impact for Fort Valley State University and its students through funded proposals, grants, corporate partnerships, IPAs, cooperative agreements, memoranda of understandings, internships, and co-op assignments. He has been successful at working collaboratively with diverse groups which include over 65 different companies, foundations, national laboratories, governmental agencies, and universities. In 1983, Dr. Crumbly developed and founded the Fort Valley State University’s Cooperative Developmental Energy Program (CDEP). Via CDEP, Fort Valley State University students have participated in over 850 internships with the public and private sectors of the energy industry, gained over 320,000 hours of hands-on-work experience, and earned over $4.5 million to help finance their education. Since 1992, CDEP has awarded over $11 million in scholarships to academically talented minority and female students. Dr. Crumbly has also exhibited his skills in inter-state and inter-institutional curriculum development. In 1992, he developed dual degree programs between Fort Valley State University and the University of Nevada at Las Vegas in engineering and health physics; and in the same year, he developed dual degree programs in geology and geophysics between Fort Valley State University and the University of Oklahoma. As of 2017, the dual programs have been expanded to include Georgia Institute of Technology, Pennsylvania State University, University of Arkansas, University of Texas at Austin, and the University of Texas Pan American. Combined, these dual degree programs have graduated 107 minority engineers, 39 minority geoscientists, and 9 minority health physicists. Also as a result of CDEP, Fort Valley State University ranked number one in the nation in graduating African Americans in Mathematics and Statistics in 2011, 2014, and 2015. FVSU-CDEP has recruited and graduated 154 mathematicians, 54 chemists, and 24 biologists. Dr. Crumbly’s vision has prepared many CDEP scholars to pursue careers as engineers and scientists working in industry and governmental agencies. In 1993, he implemented a 9th through 12th grade pre-college STEM pipeline program called the Mathematics, Science, and Engineering Academy (M-SEA). Upon completion of the 4 year M-SEA program, M-SEA scholars have the opportunity to follow one of CDEP’s collegiate dual degree programs. Many have graduated with STEM degrees and are now employed as engineers and scientists in STEM related industries. Dr. Crumbly has also had a successful career as a researcher. In addition to his research at Fort Valley State University, Dr. Crumbly has successfully completed research appointments with the Tennessee Valley Authority, Oak Ridge National Laboratory, and Lawrence Livermore National Laboratory. Additionally, he has conducted research for the U. S. Department of Energy, the U. S. Environmental Protection Agency, and the Southern Education Foundation. He has been recognized nationally for his creativity of introducing innovative programs and has received numerous awards which include recognition by two presidents: A letter of commendation from President Ronald Reagan in 1988 for exemplary achievements as an educator, researcher, and role model. In January of 2011, he received President Barack Obama’s Presidential Award for Excellence in Science, Mathematics, and Engineering Mentoring; other notable honors include Honorary Doctorate of Science presented by the University of Arkansas in 2010; selected to President Barack Obama’s PCAST Working Group on Science, Technology, Engineering, and Mathematics (STEM) Committee for Higher Education in 2011; recipient of the Geological Society of America’s 2014 Bromery Award; and became Geological Society of America Fellow in 2015. Crumbly has been married to his wife Dorothy for over 50 years; they have two sons, two daughters, and six grandchildren.